New parents Kylie Jenner and Travis Scott appear to have secured a babysitter for the weekend. 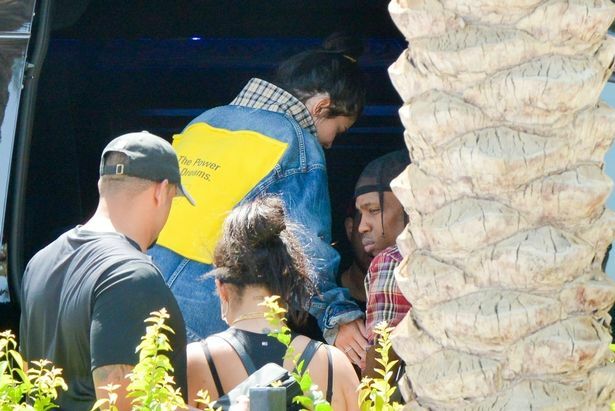 The couple were spotted partying at Coachella festival in Indio, California, as they hung out with her big sister Kourtney Kardashian . Kylie, 20, and Travis, 25, welcomed their first child, Stormi Webster, just over two months ago. But this weekend, they were seen enjoying some time away from their parental duties as they headed to the famous music fest. They were joined by Kylie's BFF Jordyn Woods and Kourtney Kardashian's beau, Younes Bendjima.